Berkeley, CA â€“ 21 November 2011—When Joe Casey (BUTCHER BAKER, THE RIGHTEOUS MAKER and GODLAND) and Nathan Fox (BLUE ESTATE, Florescent Black, and Pigeons From Hell) threaten to shake things up, it turns out that they unleash a category 5 tornado of shockingly visceral, brutally unpredictable comics. While Todd McFarlane and Robert Kirkman’s HAUNT series was never meant for the faint of heart, come issue #19, things get a whole lot nastier! Casey’s uniquely twisted storytelling voice and Fox’s dark, gritty, and gestural brushwork are taking hold of the characters and world that Kirkman and McFarlane initially populated and fleshed out, and transforming them. The arrival of HAUNT #19 was pushed back a few weeks to give time for the preceding issues’ release, but now the new team’s debut issue is set to arrive in stores on November 30th, and their over-the-top new direction promises to be well worth the wait! 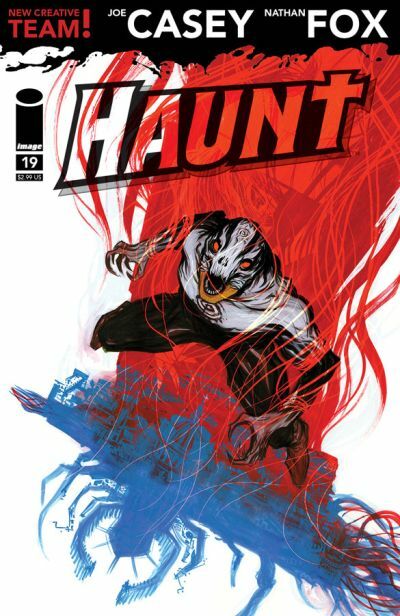 As the final release date for HAUNT #19 creeps closer, McFarlane, who is still involved in this unique multiple genre series in an editorial role, expects the response from comics and horror fans to be overwhelmingly positive. HAUNT began with a story of two brothers, one a priest and one a dangerous secret agent. When one brother is murdered, his spirit becomes bound to Earth. He continues to hover around his brother, speaking to him… haunting him. A sudden trauma leads the surviving brother to discover that he can temporarily join with his deceased brother’s spirit to become something else… HAUNT. There are two previously collected volumes of HAUNT, with more issues available monthly. HAUNT #19 (JUL110423), a 32-page full-color horror comic book for $2.99, will be on sale in stores on November 30.